The Bali 10 Sit-On-Top Kayak is perfect for your next adventure. 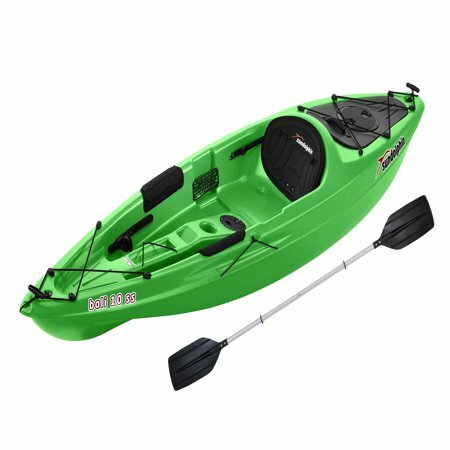 Great for recreational use on the lake or river, this one-person kayak features a lightweight, easy to carry design with an open cockpit for easy entry and exit. An incorporated Portable Accessory Carrier can be used as a tow behind or extra storage compartment, while adjustable foot braces and a large seating area keeps you comfortable the entire trip. Received the yak in good condition with a paddle, which isn't mentioned on the site. Good yak for the money. Glides through the water nicely. Will definitely buy another one. I will also purchase my own paddle to get the correct length I need. I love my kayak. It's extremely stable in the water. I bought it for fishing and it worked perfectly. I have used it on the main channel at The Lake of The Ozarks and the wake from speed boats didn't effect the stability at all. I love the adjustable foot rests. They're easy to adjust even while in the boat. There's enough leg room and storage area for my tackle and pole. It's not heavy at all for me (I am a 54yr old Granny). 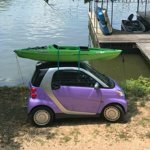 I can put it on top of my Smart Car by myself (the car may be small, but it's the same height, if not taller than, other cars). The only things I wish were different would be to have pole holders (but, it wasn't made to be a fishing kayak) and the round storage compartment in front of the seat isn't big enough for my iPhone7. The compartment is not waterproof, just watertight, so everything needs to be in a ziplock if you don't want it wet. Also, I bought it because of the extra watertight pull-along and the storage in the back. I have never used it. I found it too difficult to turn around while in the kayak to reach anything. I'm sure that is meant for people who are actually kayaking and hauling their stuff downriver to the next campsite. I would highly recommend this kayak! 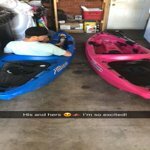 Bought my pink kayak in April and anxiously waited for the water to warm up to use it! As a beginner who only rented a kayak about 4 times before buying this one, I am very happy with it! It tracks well, easy to handle size, very affordable price, good design with the paddle holders and cup holders. WalMarts ship to store pick up was questionable though, the kayak arrived gouged and the rear storage pod lid was cracked from something heavy probably dropped on it. But the manufacturer made it right and sent me a brand new part within just days of my email to them. My purpose in buying it was for some fun summertime excercise on the water, and it fits my requirement perfectly! I am SO glad we bought these. They have good storage for drinks, clothes, etc in the back, plenty of storage in the sitting area (cup holder, sealed compartment for items, slots for holding things), and it's so comfortable compared to others I've ridden in. I get tons of compliments on them and lots of questions about where I bought them so they can buy one. There are a few small differences between the two but nothing major (one came with scupper plugs while the other didn't, one has a different style lid on the back, one only has two holes and one has four where the scupper plugs would go, etc). I would recommend these for sure! 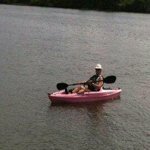 I am a kayak fisherman and have a couple of high end fishing kayaks. 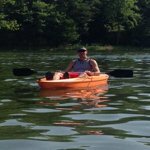 I wanted a spare light weight kayak that had some of the features I enjoy in my other boats. I saw this online and thought it looked pretty nice but was skeptical because of the low price. I must admit once I got it I was really happy with it. I modified it to my liking but even without the modifications this is a really great boat. It tracks well and is an easy paddle. I love that it has the paddle holder on either side, the floating storage bin, storage for a cell phone, drink holder etc.... I don't think I would take this out in the bay with the waves and tides and it is not really meant to be standing up in but overall for the price this is an excellent buy. Great kayak for ponds and lakes..